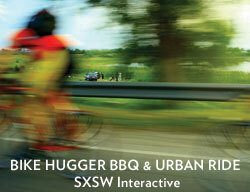 Back from Vegas and onto Austin for the Urban ride and BBQ. See you all there. We’re easy to spot in our hugger gear and we’ll blog all the Austin urban cycling here, in our photostream, and huggacasts. Next Next post: Austin by way of Memphis and Montreal?